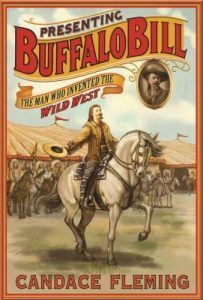 Buffalo Bill, born in Iowa as William Frederick Cody in the mid-1800s was a showman who would create the perceptions that persist today as the American West. The Codys and their seven children moved west to lawless Kansas. Several children died. Will’s father, Isaac, was hunted by pro-slavery men who vowed to kill him because they mistakenly thought he was an abolitionist. Even before Isaac died, when Will was nine, he scouted the frontier to earn money to support his family. Author Candace Fleming begins each chapter with an act from what would become Bill Cody’s Wild West show in “Presenting Buffalo Bill: The Man Who Invented the Wild West” (Neal Porter/Roaring Brook 2016). Employing hundreds of Indians, cowboys, with horses, deer, and buffalo, Will Cody (Buffalo Bill) toured the U.S. and Europe, performing immense outdoor programs for millions, including Queen Victoria. His troupe would pitch camp over multiple acres and the audience could visit the cabins and tipis to see how people of the American west lived. Indian women who accompanied their men could sell their beadwork and moccasins. Bill claimed that each “act” came from his own life—a Pony Express Rider, Scalping Indians, Riding with Wild Bill Hickok. Were his stories truthful? Some were. Fleming gives us sidebars headed “Panning for the Truth,” explaining how she divided truth from fiction. For instance, when Cody claimed to ride with Bill Hickok out west, Hickok was living in Vermont. However, the account of Cody’s sister, Julia, is corroborated by historic documents, so hers is deemed accurate overall. With all his braggadocio, it’s not always easy to like Buffalo Bill Cody. Scalping Indians? He probably did scalp one man—Yellow Hair. But Cody was also an admirer of Indians. When the U.S. Army asked him to bring in his friend Sitting Bull, who the U.S. Army saw as a threat, he agreed. Against logic, you want him to set Sitting Bull free. But it was too late. Another army official who had a personal grudge against the chief got there first and killed Sitting Bull in a blood bath. Buffalo Bill would have been the better liaison in this matter. Being in favor of the Indian overall, I feel that Fleming gives Native Americans a fair shake. She describes how the U.S. government went back on its word repeatedly—tragically—all to destroy the Indian population and culture. And what about Bill? An argument contemporary to the time said he should have left the Indians on the reservation. Was he exploiting Native Americans? Fleming shows that Indians of many nations loved Buffalo Bill. He paid them 100 times more than they would have received on the reservation where they were starving. Those who were lucky enough to travel with the show lived their culture in small ways on the road and were not pressed to assimilate into white European culture. This is too simple a description. I urge you to read the book. Thank you so much for writing this. My boys have been interested in Buffalo Bill, and I never know what to say. This should help us all learn more. Hope you and your boys enjoy it, Shannon. Candy Fleming writes great nonfiction books. Her Family Romanov was just exquisite. Hope you’re well.